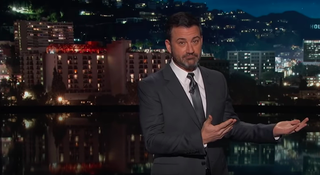 Still, pissed-off Kimmel is the most entertaining Kimmel, and the host used part of his Wednesday monologue to make a direct appeal tailored specifically to what he imagined Trump finds most galling about the ongoing hardship his bigoted, increasingly sweaty Game Of Thrones fantasy is inflicting upon the nation. No, not that “thousands of Americans are being forced to work without paychecks” or that vital services (Kimmel named food inspection, TSA, and anti-terrorism efforts) are being curtailed. Nope, Kimmel claimed he knew that what’s really eating away at Trump’s “Kentucky fried little heart” is how public perception is keeping him away from the golf course. Noting that Trump hasn’t been able to go golfing for an unprecedented 52 days, Kimmel claimed that that’s what was killing Trump more than his notoriously terrible (and low-rent) diet. Noting that we need Trump on the golf course in order to keep him from doing literally anything else (like, just spitballing here, transparently acceding to the world-imperiling demands of a hostile foreign dictator with whom he colluded in order to get elected), Kimmel made his appeal right to the source. It has to work better than an appeal to Trump’s nonexistent concern for working people, common sense, human decency, or anything else not gaudily branded with the Trump name, anyway.